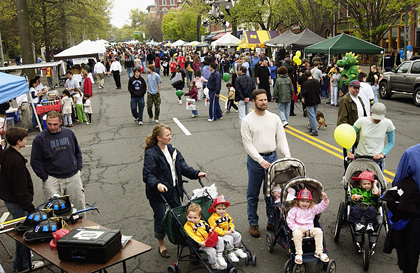 GOODBYE CARS, HELLO STROLLERS: Nassau Street looked like a carnival midway last Saturday, with dry weather prevailing and pedestrians and strollers free to roam and roll. For more of the sights of Communiversity, see pages 34 and 35. Princeton Regional Schools' $67 million budget and $1.9 million second ballot question were both passed by voters in last week's elections. A proposal for an as-yet-approved jazz club on Bayard Lane was met with an outpouring of neighborhood opposition last week. After months of speculation, the University Medical Center at Princeton should have a future site named by mid-May, according to Princeton HealthCare System (PHCS) President and CEO Barry Rabner.